In the wild, mallard ducks tend to stay near water when they nest so whatever they choose to use as a nest is typically as close to the water's edge as they can get it. Domesticated mallards, on the other hand, don't usually build their nests from scratch but will instead 'borrow' items from people, such as, mailboxes, straw hats, buckets, baskets or anything else that is large enough to hold a duck and her eggs. Any old container will do as long as it's cozy. Take an old wooden crate and set it on the ground near a water source. Fill it with straw and wait. Broody ducks will find it and look it over real well before trying it out. Once the duck has laid her eggs, keep introducing fresh straw into the box without cleaning out the old, but don't interrupt her brood or she might abandon the nest and eggs. Select a place that is out of the main traffic area of the duck barn. Broody hens like privacy away from the flock. Build a barrier with straw bales for the duck to hide in, and she likely will burrow a hole into a bale to use that as her nest. If she has to, the duck can simply pull down more straw to help keep the eggs covered when she is out of the nest. If rats or snakes are a problem, a nest box on a pole is a good idea. This protects the ducklings and gives the mother security. An old mail box nailed to a 2x4 works great. Just leave the door open and stuff some straw inside. 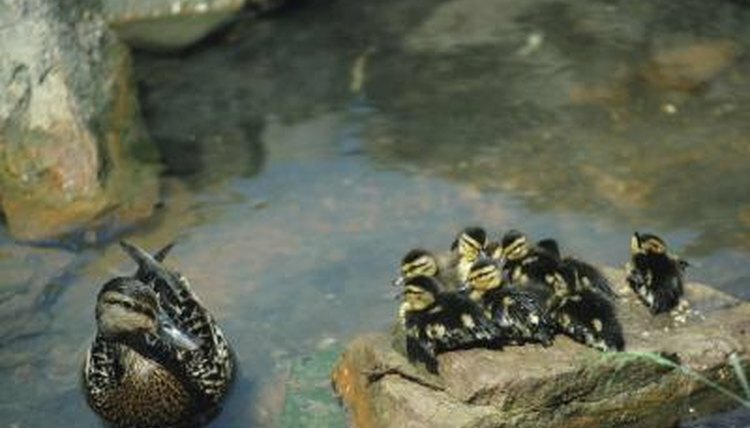 When the ducklings hatch they will fall from the nest at some point but ducklings rarely get injured from this and won't need to return to the nest again anyway. Save room in the barn by nailing old wooden crates to the wall. Several of them can be stacked in this fashion on top of each other, in case there is more than one broody hen in the flock. Simply nail each box on its side so that the open end faces front. The duck will fly up to sit on her eggs and can easily fly down again to defecate and get food and water. What Are Chickens Attracted To?